Earlier this week I introduced you to my monthly planning process by outlining Step 1: Review and assess the previous month's goals, intentions and accomplishments. Today I share Step 2: Set goals for the month to come. I use a combination of tools for this step: the Magic Money Making Kit from Leonie Dawson's Business Goddess e-course, a monthly planning calendar and a homemade tool I call the Monthly Planning Quadrant. This one came to me thanks to my software development background. It helps me differentiate between projects or initiatives that are already in place and in "maintenance" mode, and brand new products or deliverables I'm developing from scratch that haven't yet been released to the world. 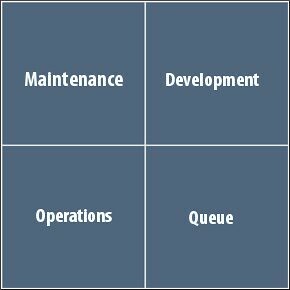 It's pretty simple really, the grid is split into four squares: Maintenance, Development, Queue, Operations. At the beginning of the month I look at what I want to do and what I already have on the go and decide in which square I'll plunk it. Easy peasy. MAINTENANCE includes stuff that's already out there that I want to keep running smoothly and consistently. Social media presence, online shop, my painting practice, etc. DEVELOPMENT is for projects, products or practices that are brand new or in progress, that haven't been completed, released or fully incorporated into my work yet. The goal is for these to eventually move into the Maintenance square. 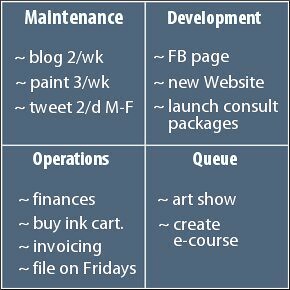 QUEUE includes tasks or projects that I want to keep on the radar, but am willing to shelve until the next month. Eventually these items will either move up to Development, be dropped altogether or stay in the Queue for an undetermined amount of time. OPERATIONS or OPS, is for back-end routine stuff to keep the business running like filing, finances, invoicing, supplies, etc. Say one month I wanted to set up a new record-keeping or accounting system I'd probably put that in the Development square though because it's a major initiative, more than the routine task of keeping my records up to date. This square is really about tasks that *ahem* should be done on a routine basis. The grid can be used in different contexts (home, work) and for different time frames (monthly, weekly, quarterly). c) remind me that not everything has to be developed at once, that there's always the Queue. I do hope you find it useful too. * Full disclosure: I am an affiliate for Leonie's products and will receive payment if you purchase a product of hers through one of my links. I only recommend products I have used and enjoyed myself or in this case, use every month!